I’ve been working with Brew Link Brewing Company for years now. I have designed their logo, their merchandise, their tap room, tents and other beer related items over the past few years. In the past few months the brand has really grown. Spanning 8 states and winning awards for their unique beer offerings. Their craft beer is really great, mixing traditional brews with some frankly, funky flavors. They have been so busy this year that I haven’t been able to post the designs I have created for their cans. 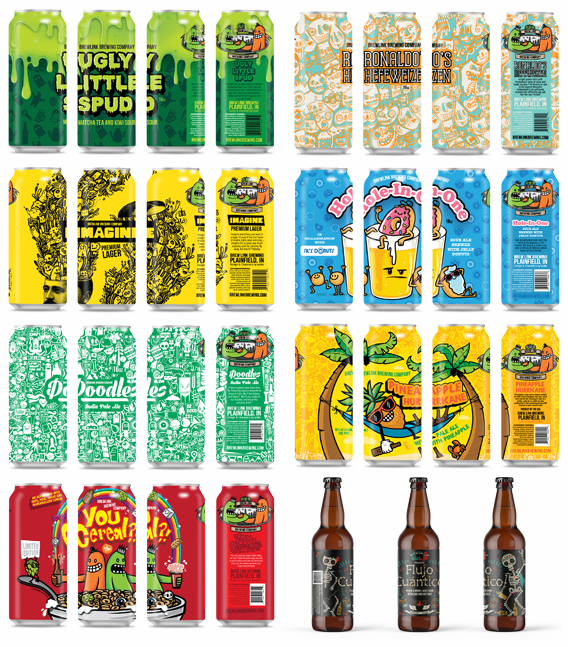 In the past 6 months I have designed 8 new brews. Insanity! 1. Flujo Cuántico – a tequila aged sour with lime and sea salt! 2. Pineapple Hurricane – a pale ale mixed with lashings of fresh pineapple. 3. Hole In One – a collaboration with Al’s Donuts. A sour ale mixed with actual jelly donuts! 4. Ronaldo’s Hef – a clean Hefeweizen named after a very special man. 5. You Cereal?! – an ale mixed with your favorite lucky cereal! 6. Doodles – a very hazy Indian Pale Ale. 7. Imagine – a crisp premium lager available as an exclusive summer release. 8. Ugly Little Spud – a sour beer with kiwi and green matcha tea! As you can see that’s a pretty unique list of beers! Designing the cans to go with these beers was immense fun and seeing this brands growth makes me smile. They work hard and push the envelope in the craft beer scene. There is definitely more to come….